Are there always crops growing in the fields below the site? Most of the time, but we can’t guarantee it. The fields below our site are owned and maintained by farmers who plant according to weather and market price. The rotation that produces vegetables for market is a constant process of tilling the soil and then planting, watering, and harvesting the crops. No odor comes from the fields. Can we pick our own caterer? No. We work exclusively with Command Performance Catering. 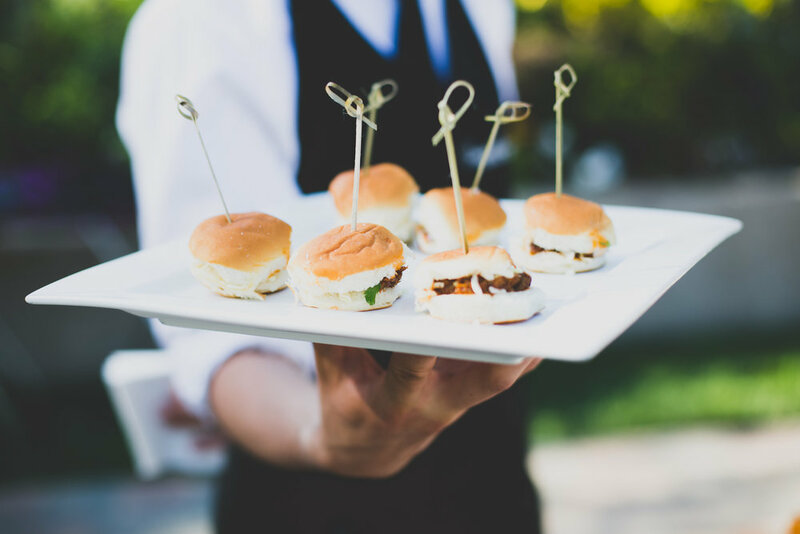 With 30 years of experience and more than 10 years of being our exclusive caterer, we have more confidence and trust than ever in Command Performance Catering’s ability to create a meal that will complete your day. You can choose from a selection of six price points, and numerous food choices within that range. Our couples appreciate their flexibility and desire to help bring your vision to life — so, if you have a special idea, be sure to take it to Robert, our catering manager. Can the caterer provide a Kosher meal? Command Performance Catering does not provide an entire Kosher reception, but they can bring in a small amount of Kosher meals at an additional price. Will Maravilla Gardens fit into my budget? Including the site, catering, and rentals, our weddings run from a minimum of $15,000 on a Friday or Sunday (75-person guest count, buffet meal) to $50,000 on a Saturday (300-person guest count, plated meal). Our packages include the site, caterer, day-of coordinator, and all the rentals you will need. What is it that I will need to supply? You will need to supply the music, flowers, photography, videography, photo booth, and the officiate. You will also be responsible for bringing your own alcohol (no corkage fee) and dessert (no cutting cost). We show the venue by appointment only. That way, we can focus on you and your needs. Please contact us to inquire or schedule a tour. Typically, we book 12 months prior to each wedding, but that varies. Our season begins the second weekend in April and ends after the last weekend in October. Yes. Depending on whether or not we have a wedding the day before your wedding, our rehearsals are held on our first available early afternoon or evening prior to your wedding. We can accommodate up to 300 guests, and offer ample parking with 150 designated spaces. How late can we stay in the evening? The site is yours from 2:30 p.m. to 10:30 p.m., vendors can arrive at 1:30 p.m. The music must be off by 10 p.m., in accordance with our Ventura County ordinance and cannot be extended. If you want an after-party, we recommend The Manhattan (they’re open until 12:30 a.m. and located just two miles away) or The Courtyard Marriott (they have a lobby area with a bar and food service). Is a coordinator included? What are the coordinator’s duties? Yes, we provide a day-of coordinator who goes above and beyond what is typically offered at other venues. 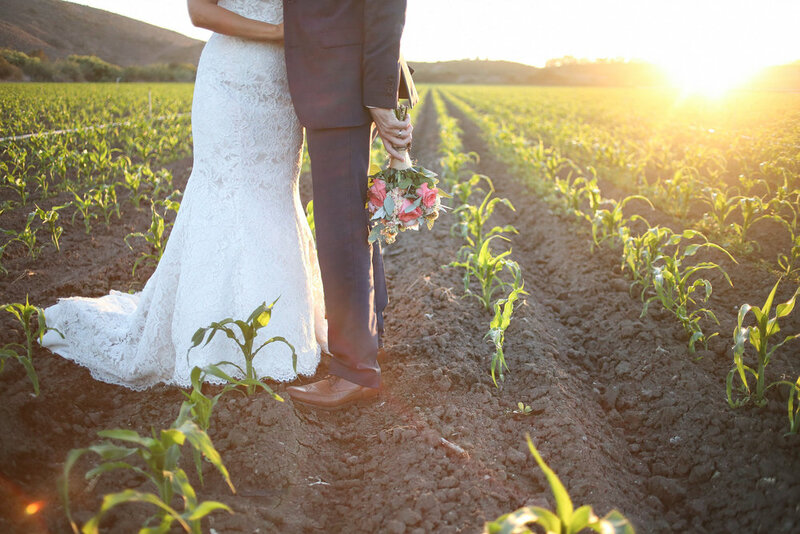 Before your wedding day, our coordinator will begin working with you 30 days in advance, provide guidelines to design a timeline for the day, and attend your 10-day prior meeting. On the day of your wedding, our coordinator will arrive one hour before you to set up your items and work with the vendors you hired, as well as the caterer, to keep them on schedule. The coordinator will also direct guests throughout the evening — from start to finish — to ensure you and your friends and family can relax and enjoy your wedding day. Is your site handicapped accessible? It rarely rains between April and November. On the off chance it rains, Command Performance can help you rent a tent through A Rental Connection. After reserving one, they will make a recommendation on if the tent is really needed within the week of your wedding day based on the weather forecast. Early in the day, guests can access restrooms located near the ceremony area. For the cocktail hour and reception, guests can use our easily accessible executive restrooms. What is your site fee? For 2019 and 2020, our site fee is $6,450. Weddings on Saturdays and any major holiday require an additional fee of $6.00 per guest. That fee is waived for Friday and Sunday events, except for the Sundays prior to Memorial Day, a Sunday when Monday is the 4th of July, or Labor Day. And, when the 4th of July falls on a Friday. What is your minimum number of guests for Friday, Saturday and Sunday? For Saturday, our minimum is 125 guests. For Friday and Sunday, our minimum is 75 guests. For holiday Sundays, our minimum is 125 guests. If you do not meet the required number of guests, you can still get married at Maravilla Gardens by paying for the minimum number of guests for that day. What lighting is included in your site fee? Can more be added? Our included lighting is more than sufficient for your wedding. There are twinkle lights in four of the large trees in the reception area, market lights strung across our reception area, as well as accessory lighting around the perimeter, and landscape lighting throughout the site. Is the dance floor included? How many can it accommodate? Our built-in dance floor is made of stamped and stained concrete material, and works well for weddings up to 300 guests. Can we have candles on the tables? Yes, though candles must be in glass votives or hurricane shields. Be sure they are designed to burn for 6 hours. Yes. When you complete your signing packet, we will provide a list of preferred, experienced vendors who we know and love. Check is the most common, but we can also accept cash, money order, or cashier’s check. We do not accept credit cards. What can we do if it is too hot or too cold? At your 10-day meeting, we will look at the weather forecast, and then advise you based on our experience. If it’s too cold, we have heaters available on site that rent for $85 each. You will need one heater for every 20 guests. On warm days, we have a mild coastal breeze, shade provided by large trees, and a custom-made shade canopy to cover guests in the ceremony area. Yes, you will need day-of liability insurance. Our insurance will cover general liability for the property. Your insurance will cover any unforeseen issues related to you and your guests. Additional insurance protects both of us. You can often get this insurance through your homeowner’s policy or through R.V. Nuccio at www.rvnuccio.com. The cost is $125. Yes, you will need to purchase 5 1/2 hours of security through Sandman Security for $200. You can complete this purchase at your 60-day prior meeting. Security comes dressed as a wedding guest and will respond to any unexpected situations to ensure your guests stay safe all evening. Do you have an indoor option? No. Maravilla Gardens is an outdoor wedding venue. If we suspect rain, we can help you arrange to rent a tent. Can we have a full-sized band? No. Our venue cannot accommodate full-sized bands because they exceed Ventura County’s sound ordinance — while DJs do not. However, up to four musicians can play in the ceremony area, during the cocktail hour, and during dinner. The DJ will still cover the sound system and mic for the ceremony, the cocktail hour (if you wish), and take over from any musicians during the toasts.